The West Lancashire Masonic Charitable Foundation 2021 Festival is organised at Provincial level. The Festival President is the Provincial Grand Master, Tony Harrison and its Vice President is Assistant Provincial Grand Master, David Winder. The Festival organising Committee incorporates people with specific skill / knowledge in the areas of Charity and how it operates. 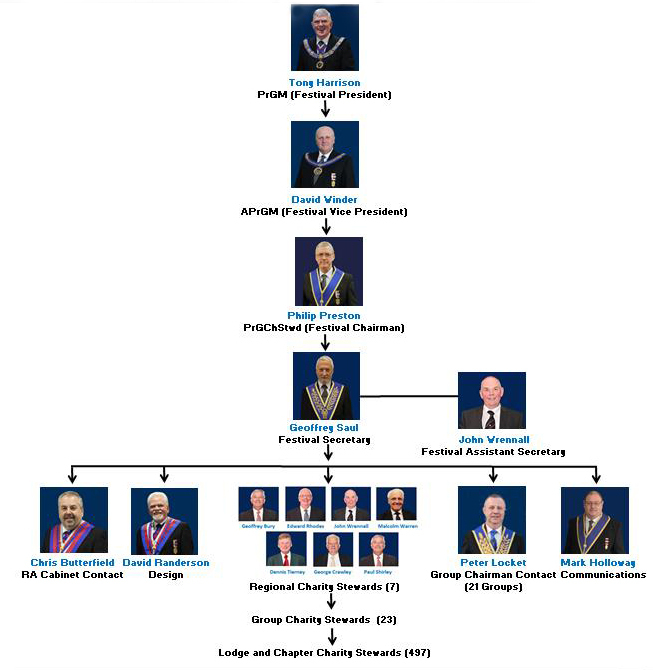 It also covers design, communication, in all its forms to Members, Groups, Lodges and Chapters. David Winder heads up the committee, Phil Preston Provincial Grand Charity Steward is the Festival Chairman, Geoff Saul is the Festival Secretary, he is assisted by the assistant secretary John Wrenall. Also appointed to this committee is David Randerson who is responsible for design and marketing materials together with Mark Holloway who is the communications officer. Chris Butterfield is the representative from the Royal Arch Cabinet and Peter Locket is the representative for the Group Chairman backed up by the eight Regional Charity Stewards.